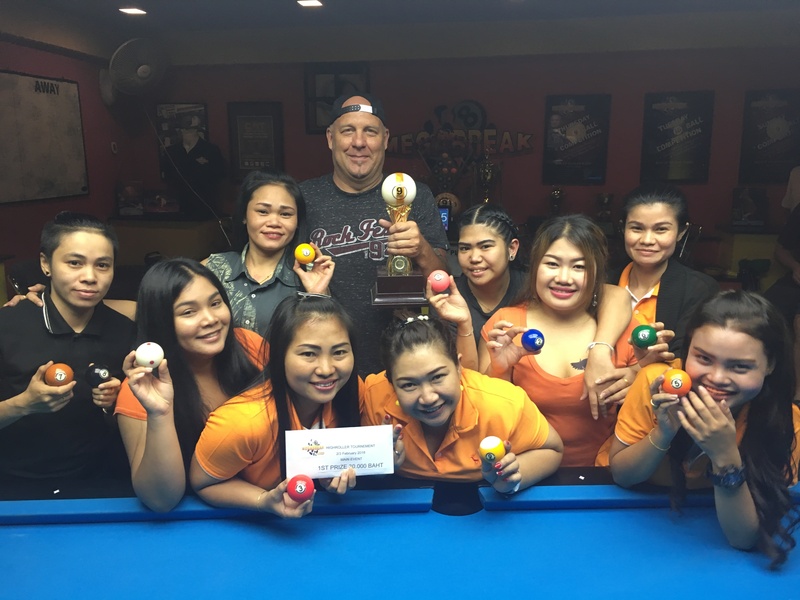 9 BALL HIGH ROLLER REPORT : JEFF IS CHAMPION. FRIDAY 2nd and SATURDAY 3rd FEBRUARY. 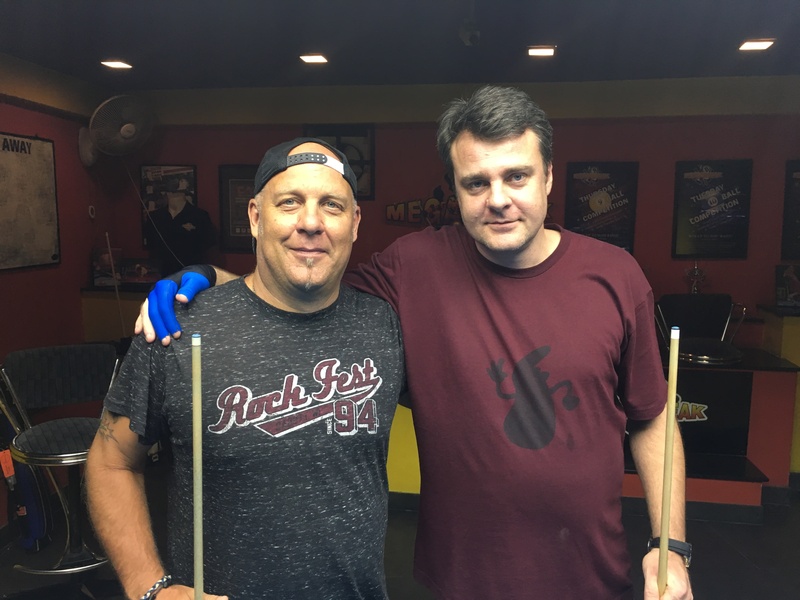 Congratulations go to Jeff Schmitt from Wisconsin, USA for winning our 9 Ball High Roller Competition here at Megabreak last weekend. 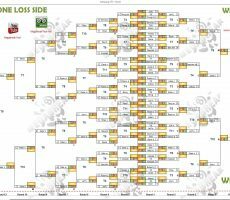 Once again the tournament was filled to capacity at 64 players and was dominated by players at the lower end of the handicap scale. 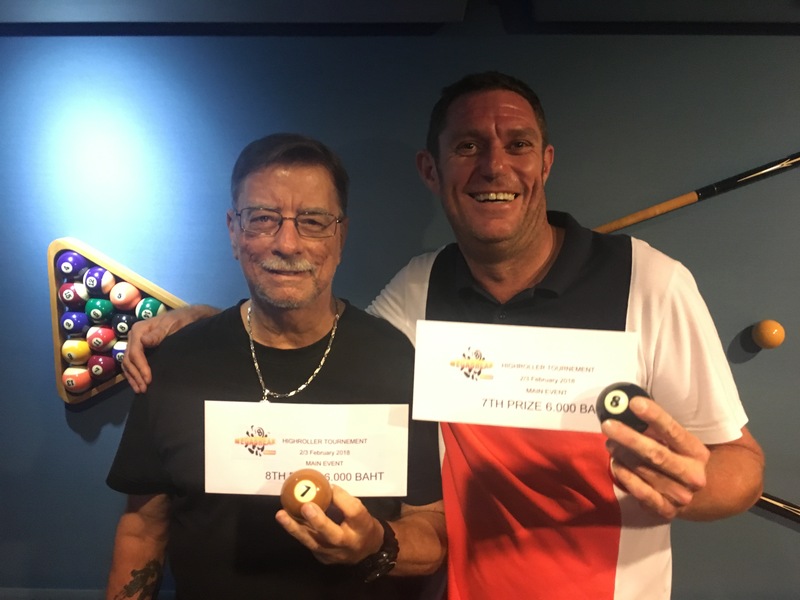 Jeff played consistently well throughout the two day event, remaining undefeated whilst winning seven consecutive matches and ended up a very worthy winner. What made Jeff’s achievement even greater was that before his Last 16 match on the second day, he actually BROKE HIS FOOT whilst going to the Family Mart next door!! 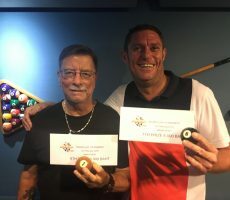 He continued to play though, fighting his way through the pain barrier whilst hobbling around the table to win four more matches and lift the trophy. 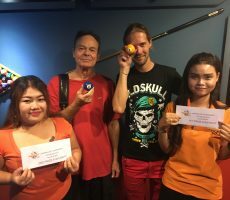 In the final he beat his friend Peter Nielsen from Denmark in the deciding rack of the first of two sets (race 4-6) to pocket the 1st Prize of 30000 baht. 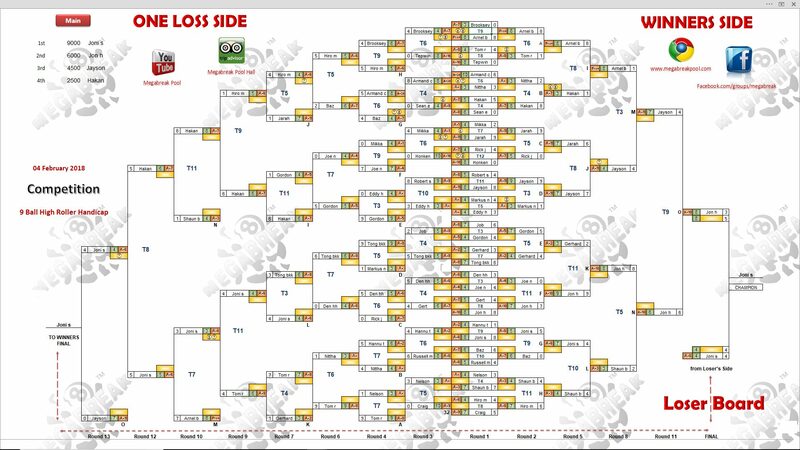 Peter fought his way through five matches on the One Loss Side of the draw to reach the final, before just falling short against the “wounded warrior”, and took home 20000 baht as Runner-Up. 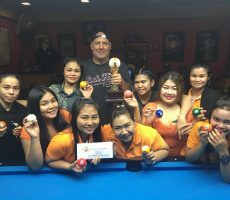 Champion : Jeff Schmitt (A+3) – 30000 baht. 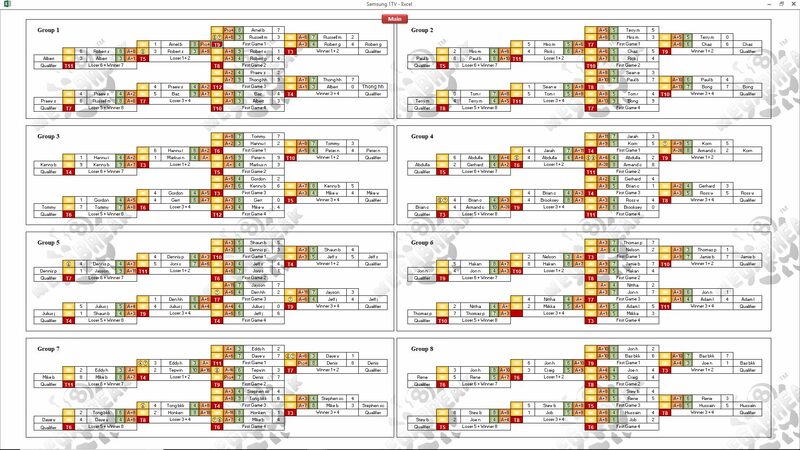 Runner-Up : Peter Nielsen (A+5) – 20000 baht. 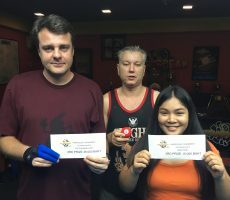 3rd Place : Mike Berezovsky (A+7) – 15000 baht. 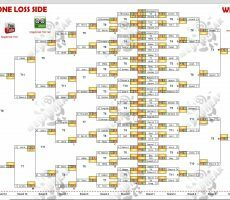 4th Place : Korn Aksonsil (A+9) – 10000 baht. 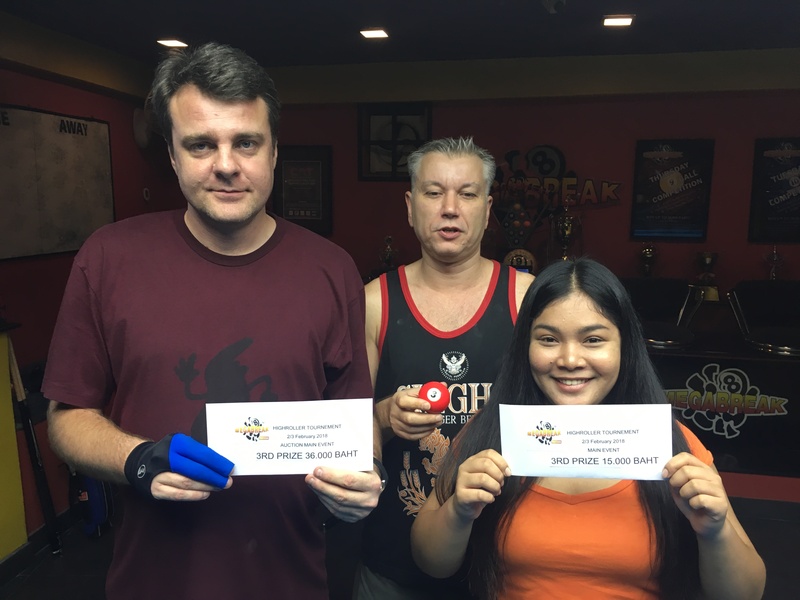 Equal 5th Place : Renè Heiniger (A+7) and Julius Jackson (A+4) – 8000 baht each. 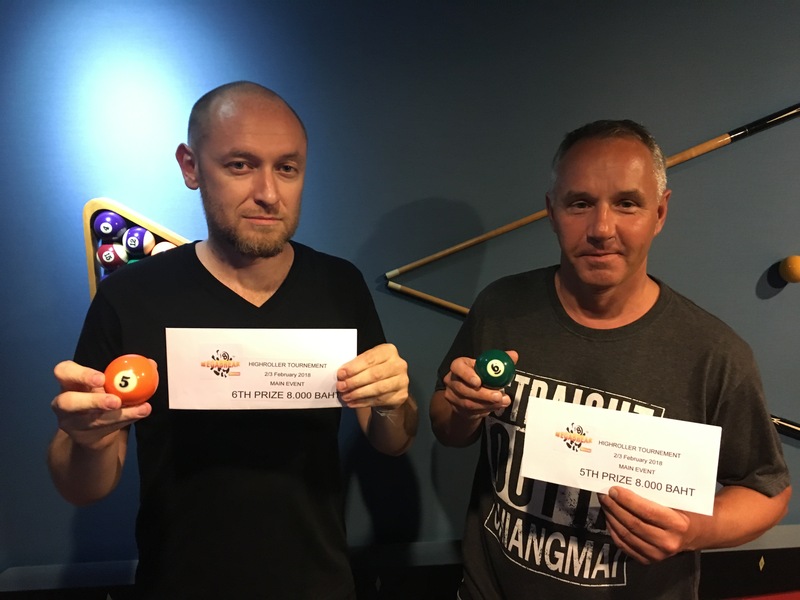 Equal 7th Place : Charlie Ayres (A+6) and Mike Warner (A+3) – 6000 baht each. 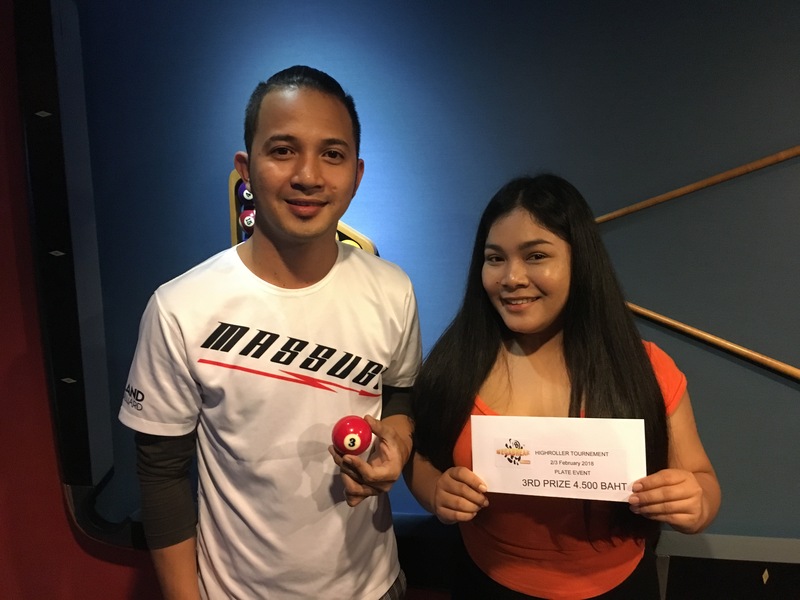 The Player Auction as always added enormous extra interest to the competition, with the Prize Pot totalling a staggering 279000 baht!! 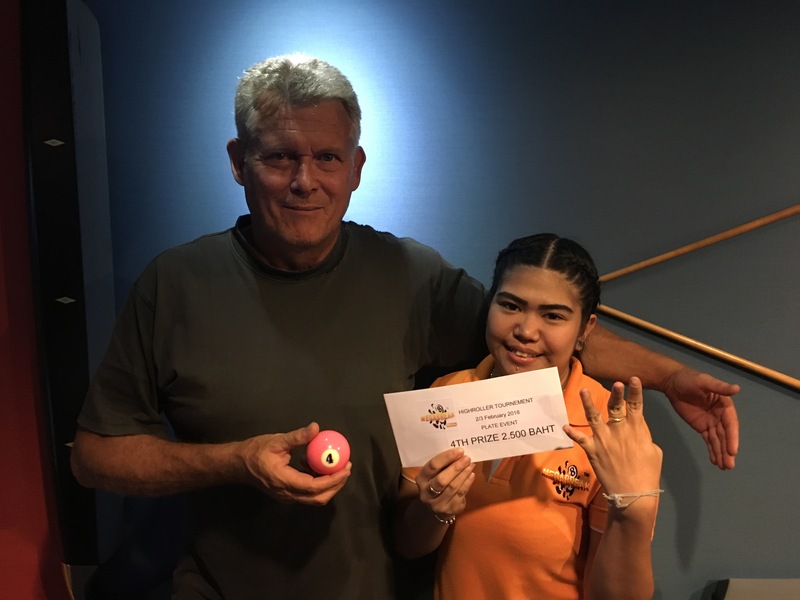 Brooksey Brooks was our winner, buying Jeff for 6000 baht, and collecting a share of the 1st Payout of 80k. 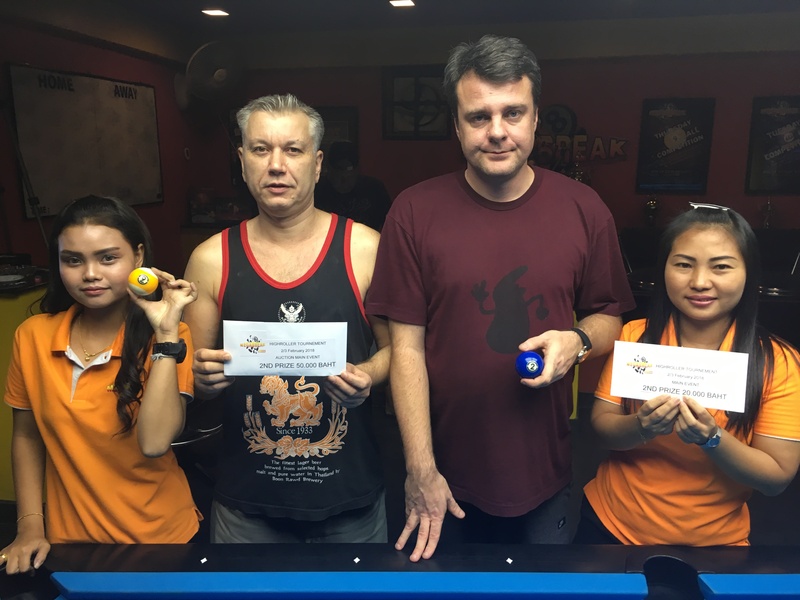 1st (29%) : Brooksey (Jeff) – 80000 baht. 2nd (19%) : Mike Berezovsky (Peter) – 50000 baht. 3rd (13%) : Peter Nielsen (Mike) – 36000 baht. 4th (10%) : Terry (Korn) – 28000 baht. Equal 5th (6%) : Scott (Rene) and Russell Masciotti (Julius) – 18000 baht each. 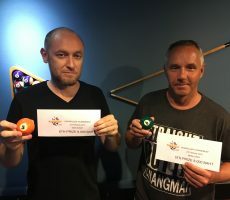 Equal 7th (4%) : Dave Chalmers (Charlie) and Russell (Mike W) – 12000 baht each. 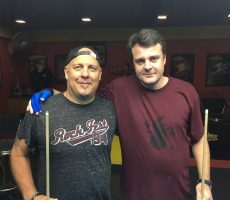 The Plate Event for the non-qualifiers from the Group Stages on Day 1 was won by Finland’s Joni Savolainen, beating Jon Hernandez from The USA in the final. 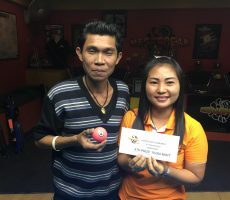 Winner : Joni (A+6) – 9000 baht. 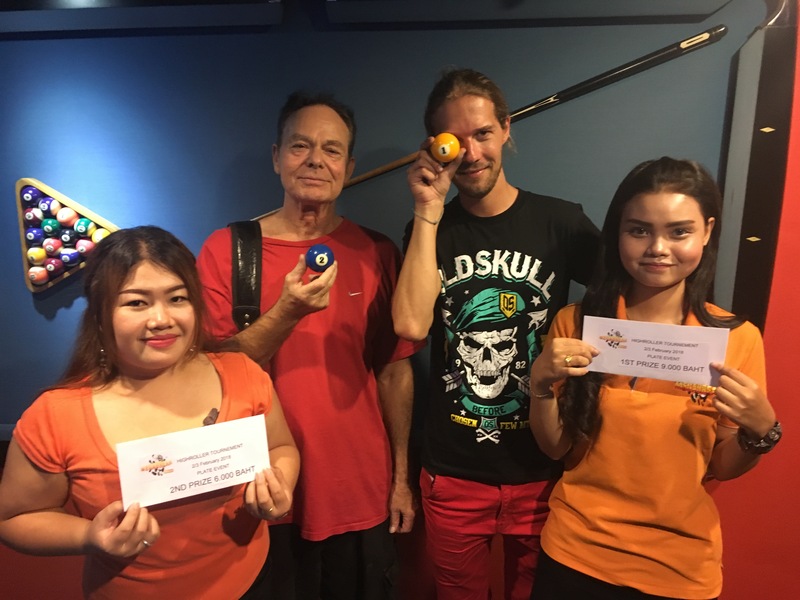 Runner-Up : Jon H (A+10) – 6000 baht. 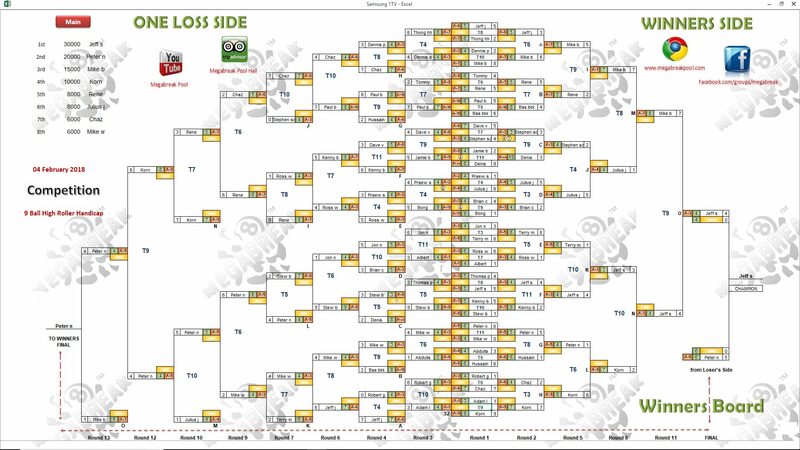 3rd Place : Jayson de Chavez (A+11) – 4500 baht. 4th Place : Håkan Ekberg (A+7) – 2500 baht. 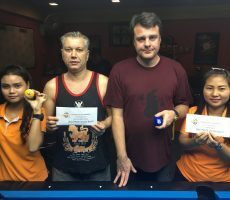 1st (3.5%) : Peter Nielsen (Joni) – 10000 baht. 2nd (2.5%) : Jeff (Jon) – 7000 baht. 3rd (1.8%) : Jon Nash (Jayson) – 5000 baht. 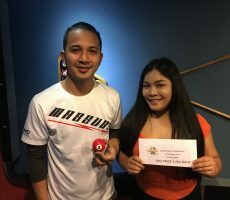 4th (1.2%) : Mike B (Hakan) – 3000 baht. Megabreak would like to thank all the players, staff, and helpers who assisted in once again making the tournament a huge success.